ANNEGRET KRAMP-KARRENAUER, an ally of German Chancellor Angela Merkel, has been elected as the new leader of Merkel’s centre-right party. Kramp-Karrenbauer narrowly defeated Friedrich Merz, a one-time Merkel rival, at a congress of the Christian Democratic Union in Hamburg on Friday. She won 517 votes to Merz’s 482 in a run-off. A third candidate, Health Minister Jens Spahn, was eliminated in the first round of voting. 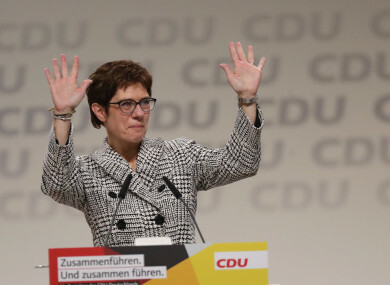 The 56-year-old Kramp-Karrenbauer has been the CDU’s general secretary, in charge of day-to-day political strategy, since February. She was previously a popular governor of western Saarland state. She now inherits the task of improving the CDU’s political fortunes and trying to win back voters from rivals to the right and left, while working with Merkel as chancellor until Germany’s next election. Earlier today, Angela Merkel offered a staunch defence of her moderate course during 18 years as party leader. Accepting a lengthy standing ovation from delegates, many tearful and holding ‘Thanks, boss’ placards aloft, a visibly moved Merkel said the party had won four national elections under her by holding fast to its principles. “In difficult times we shouldn’t forget our Christian and democratic stance,” she said. “Whether it’s the rejection of multilateralism, the return to nationalism, the reduction of international cooperation to deal-making or threatened trade wars … hybrid warfare, destabilisation of societies with fake news or the future of our EU – we Christian Democrats must show in the face of all these challenges what we’ve got,” she said. The two main candidates, CDU general secretary Annegret Kramp-Karrenbauer, known as AKK, and corporate lawyer Friedrich Merz were locked in a battle over whether to embrace or break with the veteran chancellor’s legacy. The contest’s outcome is expected to be crucial in deciding whether the influential leader can realise her stated goal of completing her fourth term in 2021 and then leaving politics. Merkel has led Germany since 2005 and moved her party steadily toward the political centre. More generous family leave, an exit from nuclear power and an end to military conscription are among her signature policies. While Kramp-Karrenbauer (56) is viewed as similar to Merkel with an even temper and middle-of-the-road policies, Merz (63) had become the torchbearer for those seeking a more decisive break from the chancellor. This week, Merz – who has insisted in the face of widespread scepticism that he could work well with Merkel – won the backing of powerful former finance minister Wolfgang Schaeuble, now the parliamentary speaker. “The Merkel era is palpably coming to an end,” political journalist and AKK biographer Kristina Dunz said. Merz could be tempted to see his revenge and lunge for power (as soon as next year). Few observers have dared to predict how the 1,001 delegates — political and party office holders — will vote. Email “Annegret Kramp-Karrenbauer, ally of Merkel, elected new leader of CDU party ”. Feedback on “Annegret Kramp-Karrenbauer, ally of Merkel, elected new leader of CDU party ”.